Topic: Skaven and Beastmen combined? Re: Skaven and Beastmen combined? 1.) Are Skaven and Beastmen being combined into a new race? 2.) Are Skaven and Beastmen being combined into a new army? 3.) 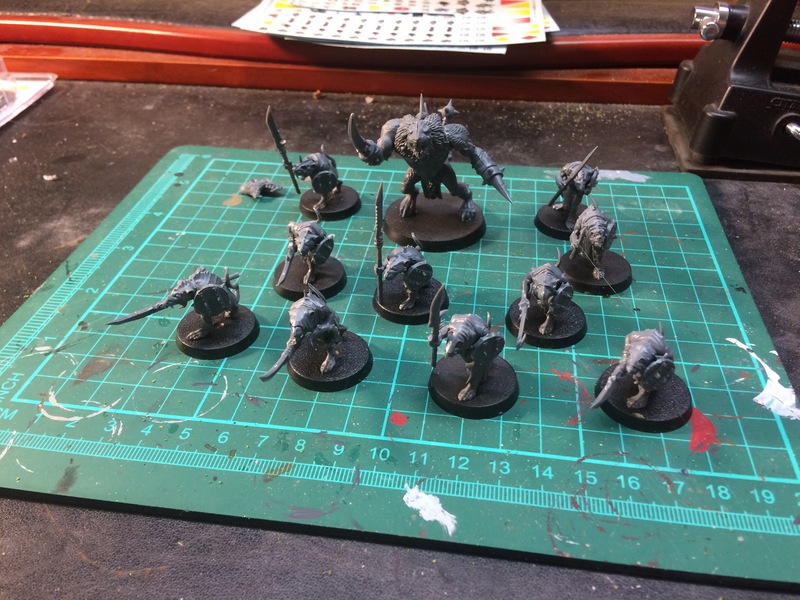 Are Skaven and Beastmen allowed to play as an army? Speaking of skaven and beastmen, has my package arrived at you yet? Not yet sir! But our postage isn't the fastest lol. Edit: they exist! I assure you. They are now appearing in numbers in my basement. Time for pest control. It was in the Old World, not the new ones. The Old world exists, the skaven don't. Skaven in the basement? That's nothing, they roam my living room, and sometimes other rooms, except the bathroom where the door is closed. Gutter runners have already infiltrated your dirty laundry bin, have no doubt about that. Wasn't sure if it was a new warscroll (is that what they are called) with some fun fluff that would have taked about what and how. No dirty laundry bin here, just a laundry bag in the closet where there is another closed door. Their tunnel-making special rule, might come in handy in that case. Do them in, the dwarven way! With flamethrowers and blasting charges. Purge them GP! For the Empire! The default core rules of Age of Sigmar, let you pick whatever units you want wiht no limits. It's up to the players to decide on any limitations or restrictions, or battleplans(scenarios). As of the General's Handbook 2016, that is now what is called Open play. There are 3 styles of play, Open play, which is do whatever you want. Narrative, where you are playing within a story style, so you're representing the battles of the fiction, the published campaigns, Path to Glory campaigns, and so on, there are still no restrictions, unless you choose to, though there sort of are with Path to Glory. And then the 3rd style is Matched play, which is intended for the competitive tournament style play, which has restrictions, and points. In matched play, you must pick an allegiance, which can either be a very specific allegiance, such as Brayherds (The man sized beastmen stuff), or you can play with a Grand alliance allegiance. So in a Grand Alliance Chaos allegiance, you can take any units that have the CHAOS keyword, so in this case you could take some Skaven and Brayherd units together with Daemons of Nurgle, or Khorne Bloodbound. Picking an allegiance gives you access to allegiance abilities, of which there is a battle trait (a sort of army wide rule), command trait (an addition rule for your general), and artefacts (for all intents and purposes, they are magic items). There are also some smaller faction allegiances you can choose (In matched play all of an army must be chosen from the same allegiance) and Brayherds are one set that has it's own allegiance abilities - command traits etc, that are more suited to that faction, and therefore you get slightly better benefits. You can still allies of up to 20% of the points, but only specific other factions, and as of Generals's Handbook 2017, none of the Skaven factions can be an ally of Brayherds or vice versa). Many people still choose to use a lot of the matched play rules to build armies even if they then play Narrative games or Open play games, as the GHB says that basically all of the GHB content is optional. Well no matched play then lol. I loved the idea though. Thank you oxycutor. I was not up to speed on where it all was up to, especially regarding competitive lists and points. I still have issues with round bases and not ranked up units on trays, but the rest sounds reasonable for a fantasy skirmish game with lots of factions.